The latest Chesterfield magistrates’ court results as published in the June 15 edition of the Derbyshire Times are listed below. Lisa Boyd, 28, of Bestwood Park, Clay Cross. Found guilty of assault by beating. Community order with a 12 week curfew with electronic monitoring. Must pay £100 compensation. Leon Simon Morris, 24, of St Augustine’s Road, Chesterfield. Admitted failing to comply with a community requirement of a suspended sentence by failing to attend with a responsible officer. No adjudication. Dealt with for the original offence of assault which was subject to the suspended sentence. Sentence of eight weeks’ custody suspended for 12 months implemented as a sentence of six weeks. Must pay £60 costs. Benjamin Alexander Johnson, 25, of Roston Close, Dronfield Woodhouse, Dronfield. Pleaded guilty to assault by beating. Community order to last until June 5, 2018, with a Rehabilitation Activity Requirement and 60 hours’ unpaid work. Must pay an £85 victim surcharge and £85 costs. Keane Mitchell Thorpe, 18, of No Fixed Abode. Pleaded guilty to damaging a nearside light of a Kia Rio vehicle. Must pay £150 compensation. Pleaded guilty to assault occasioning actual bodily harm. Must pay £50 compensation, an £85 victim surcharge and £100 costs. Community order to last until June 1, 2018, with a Rehabilitation Activity Requirement and 40 hours of unpaid work. Christopher Dean White, 32, of Meadow Road, Clay Cross. Pleaded guilty to being drunk and disorderly in a public place. Fined £40 and must pay a £30 victim surcharge and £85 costs. Pleaded guilty to failing to surrender to custody having been released on bail. Detention which was deemed served by time already spent in custody. Luke Booker, 26, of Mansfield Road, Chesterfield. Indicated a guilty plea using or threatening unlawful violence towards other persons. Must pay £85 costs. Pleaded guilty to assaulting a police constable in the execution of his duty. Must pay £50 compensation. Committed to prison for 14 weeks suspended for 12 months with an alcohol and anger management related COVAID programme and a Rehabilitation Activity Requirement. Pleaded guilty to damaging the rear windscreen of a police vehicle. No separate penalty. Julian Ronald Mallen, 37, of West Lea, Clowne. Indicated a guilty plea to having a kitchen knife in public without authority. Fined £120 and must pay an £85 victim surcharge and £85 costs. Pleaded guilty to failing to surrender to custody at Chesterfield magistrates’ court having been released on bail. Community order to last until June 4, 2018, with a Rehabilitation Activity Requirement. Beryl Blow, 79, of Carlton Close, Danesmoor, Chesterfield. Pleaded guilty to driving without due care and attention. No separate penalty. Pleaded guilty to being the driver of a vehicle owing to the presence of which an accident occurred whereby damage was caused to another vehicle and after not giving details there was a failure to report the accident to police. No separate penalty. Pleaded guilty to failing to stop after the accident. Fined £80 and must pay a £30 victim surcharge and £85 costs. Driving record endorsed with five points. John Buttress, 52, of New Linden Street, Shirebrook. Pleaded guilty to being the driver of a vehicle owing to the presence of which an accident occurred whereby damage was caused to another vehicle and failed to report the accident to police after failing to give details. No separate penalty. Pleaded guilty to failing to stop and give details after the accident. Fined £226 and must pay a £30 victim surcharge and £85 costs. Driving record endorsed with five points. Richard Adam Dawson, 32, of Bridge Yard Avenue, Ripley. Pleaded guilty to driving a vehicle on a dual carriageway at a speed exceeding 70mph. Fined £293 and must pay a £30 victim surcharge and £85 costs. Driving record endorsed with six points. Wayne Antony Stanley, 51, of Dickens Drive, Holmewood. 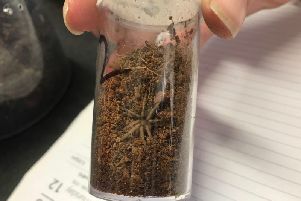 Found guilty of failing to give a specimen during an investigation when suspected of having been in charge of a vehicle. Fined £80 and must pay an £85 victim surcharge and £200 costs. Driving record endorsed with ten points. Found guilty of taking a vehicle without the consent of the owner. Found guilty of failing to provide a breath test without reasonable excuse. Found guilty of using a vehicle without insurance. No separate penalty. Pleaded guilty to failing to surrender to custody having been released on bail. Community order to last until June 4, 2018, with a Rehabilitation Activity Requirement. James Arthur Bonfield, 38, of Caernarfon Close, Swanwick, Alfreton. Pleaded guilty to being the driver of a vehicle owing to the presence of which an accident occurred whereby damage was caused to a central barrier and having not given details failed to report the incident to police. Fined £410 and must pay a £41 victim surcharge and £85 costs. Driving record endorsed with eight points. Kieran Harley Develin, 20, of Laurel Bank, Butterley Hill, Ripley. Proved in absence that he used a motorcycle fitted with an exhaust system which did not comply with regulations. No separate penalty. Proved in absence that he drove a vehicle without due care and attention. Fined £440 and must pay a £44 victim surcharge and £85 costs. Proved in absence that he drove a vehicle otherwise than in accordance with a licence. No separate penalty. Lisa Hessey, 35, of Springfield Crescent, Bolsover. Pleaded guilty to using a vehicle without insurance. No totting disqualification due to exceptional hardship. Fined £120 and must pay a £30 victim surcharge and £85 costs. Driving record endorsed with six points. Julia Melissa Affleck, 28, of Rosebud way, Holmewood, Chesterfield. Pleaded guilty to driving on the A638 Ossett bypass at a speed exceeding 50mph. Fined £124 and must pay a £30 victim surcharge and £85 costs. Driving record endorsed with three points. Ann Howe, 28, of Scarsdale Street, Carr Vale, Bolsover. Indicated a guilty plea to stealing electrical oral items valued at £105 belonging to Wilko Retail Ltd. Must pay an £85 victim surcharge and £85 costs. Indicated a guilty plea to stealing health and beauty items valued at £275.98 belonging to Boots. Indicated a guilty plea to stealing health and beauty items valued at £24.40 belonging to Wilko Retail Ltd. Admits committing an offence while subject to a 12 month conditional discharge order for two thefts and for failing to surrender to bail. No adjudication. Dealt with for the original offence of stealing scratch cards valued at £25 from Tesco Express and stealing goods valued at £29.67 belonging to Tesco Express and for failing to surrender to custody having been released on bail. Community order to last until June 4, 2018, with a two month curfew with electronic monitoring and an Exclusion Requirement not to enter Wilkinson’s Stores and Boots Stores. Must also participate in a Thinking Skills Programme and a Rehabilitation Activity Requirement. Callum Cooke, 18, of No Fixed Abode. Pleaded guilty to stealing Ariel Gel valued at £25 belonging to One Stop. Fined £40 and must pay a £30 victim surcharge and £85 costs. Adam Coupland, 36, of Rodgers Lane, Alfreton. Pleaded guilty to stealing a lawnmower valued at £160 belonging to Wilkinson’s. Committed to prison for 56 days suspended for 12 months with a Rehabilitation Activity Requirement. Must pay £160 compensation and a £115 victim surcharge and £85 costs. Philip John Clarke, 46, of Spital Lane, Chesterfield. Indicated a guilty plea to possessing amphetamine. Fined £80 and must pay a £30 victim surcharge and £85 costs.